7D Ranch offers a unique cowboy experience and cowboy vacation for individuals or families. On this Ranch Boss experience, you will have the opportunity to get your hands dirty with a huge range of ranching activities. Enjoy the ranch way and lifestyle without having to own your own ranch! The cabins aren’t just an excellent place for families and people of all types to get away and enjoy some quiet time in the fresh Texas countryside. The cabin rental options which 7D Ranch Texas has are also great for those looking for a spot to post up after or before attending Aggie football games, or those attending Bryan / College Station events. 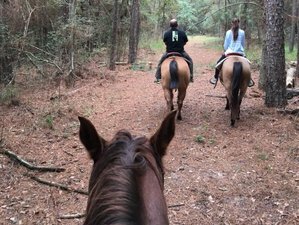 With all these cowboys cabin rental and ranch rental options available, it’s no wonder why people are more than happy to spend days on end here at 7D Ranch Texas, having a blast and forgetting all about their everyday problems. Since the early ’80s, 7D Ranch Texas' owner Keith Debault has been looking for ways to share his passion for ranching and his love for the cattle business with people from all different backgrounds. Through the years, it has become even more evident to this third generation rancher how important it is to give city folks the opportunity to experience a working ranch and live the “Cowboy Way”. Keith’s odyssey in the cattle business began over 40 years ago when he started his own personal operation with 300 head of cattle on leased pasture. Today, the 7D Ranch Texas encompasses several thousand acres of owned land that is home to several thousand heads of top-quality cattle. Drawing off the experience he has gained from working alongside his grandfather Emil, his father Fred, and now his sons Lange, Blake and Preston, Keith has developed the "Cowboy Time Share" concept that provides opportunities for people to witness first-hand the process of developing quality grass-fed beef from the pasture to the table. 7D Ranch Texas' "Cowboy Time Share" offers family and friends the unique opportunity to come together and enjoy the activities found everyday on a ranch. The available packages offer you the opportunity to stay at the ranch several times a year and get your hands dirty, working alongside the Cowboys taking care of the cattle. You can learn to ride, rope, and wrangle by experiencing the day to day activities of a genuine Texas cattle operation. Enjoy the rewards of the "Cowboy Time Share" by owning a calf to be grass fed and butchered or sold at the end of the year. What do the Cowboys of the 7D Ranch Texas do when the cattle are worked and left alone to graze? You can bet they kick back and relax by taking advantage of the beautiful lakes on the ranch, which can be used for canoeing, paddle boats, etc. Then at the end of the day, sit back and enjoy good food and conversation with your family and friends around the campfire. In addition, 7D Ranch Texas USA offers many breeds and classifications of cattle such as Angus +, Brahman, Black Baldies +, Braford, Brangus, Brangus Baldies, Hereford, and tigerstripe. These are offered as Yearling grass-fed slaughter cattle, replacement heifers, first-calf heifers bred to Angus, Angus +, Brahman, Brangus, or Hereford bulls, and first-calf pairs. This vacation will take place in 7D Ranch Texas, USA. Located in the Brazos Valley, 7D Ranch Texas is a working cattle ranch situated on 1,600 acres land just outside of Navasota, Texas. You will be served three breakfasts, three cowhand lunches, and two cowboss dinners and one BBQ dinner. The breakfast for day one will contain biscuits and gravy. For day two, it will contain eggs, bacon, and biscuits. Lastly, for breakfast on day three, you will be served pancakes and sausage. Some of 7D Ranch Texas' dinners include the grass-fed heads the Cowhand ’80s and the Chuckwagon Trail Ride Dinner. The Chuckwagon, in particular, is a massive feast, so don’t attend this one unless you plan on packing down a whole lot of delicious home cooked food! The cabins are stocked with everything you need and they even have a fridge to store your food in case you don’t plan on taking advantage of the host of various different dining options they have available upon request. You can get extra breakfasts on day two (8 USD / each) and day three (10 USD / each). You can also get extra cowboy lunch for 18 USD / each. For dinner, you can also get barbecue dinner (20 USD / each) and extra cowboss dinner (35 USD / each). 7D Ranch Texas provides their customers with a quality cut of beef at an affordable price. The best way for them to accomplish this is to offer their own personal beef straight off the ranch. They the best genetics for meat quality available for their dams and sires to provide an offspring of this superior genetics. Being able to provide a superior quality beef product is their first step in allowing their valued customers to serve the very same beef you enjoy yourselves here on the ranch. Moreover, you can also buy the processed / packaged grass-fed beef for 1,225 USD / head. Prior to processing, beef can be divided into for quarters. The processed beef package option can be taken within six months of purchase.7D Ranch Texas' cattle has almost 2,000 acres of native pasture to graze and natural creeks and springs to drink the cleanest water possible. This ensures your beef from them has had lots of space and a clean environment for healthy growth. 7D Ranch Texas' grass-fed beef will be one of the healthiest cuts of meat you can prepare. They use absolutely no antibiotics or growth hormones. All their cattle are all-naturally born and raised on fresh green grass and their mommas' milk. Their dams are superb milk producers which provide the key essentials for growing the healthiest tastiest beef with a great flavor. This vacation requires a minimum of four riders.